Iraq says that after a month of "intrusive, extensive and sometimes aggressive" inspections, the United Nations has found no evidence that Baghdad has weapons of mass destruction. General Hossam Mohammad Amin, chief Iraqi liaison officer, told a news conference in Baghdad that 188 sites had been visited so far, but nothing had been found as Iraq had nothing to hide. 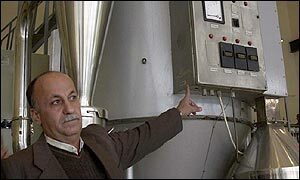 Mr Amin said this proved that the Iraqi weapons declaration of 7 December was accurate - the United States, Britain and chief UN inspector Hans Blix have said it is old and incomplete. Mr Blix is due to report to the UN Security Council on 27 January. The Iraqi Government has meanwhile begun helping its citizens stockpile food in case of a US-led attack against Iraqi leader Saddam Hussein - Washington has already sent thousands of troops in the area. Nato's Secretary General George Robertson has defended the US policy on Iraq, saying there is no question of the Americans taking unilateral military action. On Thursday, the Iraqi military said US and British warplanes carried out bombing raids in the south of the country, killing three civilians and injuring 16. "The activities of the inspectors have not supported, directly or indirectly, American and British allegations," General Hossam Mohammed Amin said. "The inspection teams found proof of the credibility of the Iraqi [weapons] declaration that was presented this month to the Security Council," he said. Mr Amin said the inspectors had visited nearly 200 sites, including 32 facilities that had not been inspected by previous teams. With no Christmas break, inspectors visited three more suspect sites on Thursday - and also interviewed an Iraqi scientist at Baghdad's Technology University on Thursday. They questioned the dean of the university about his staff and their research programmes - but he refused their demand for a private interview, the first of its kind, Mr Amin said. The Iraqi official said it was not up to the government to either support or oppose the decision of Iraqi scientists to be interviewed in private. "But we do not think there's a need for the interviews to be conducted abroad," he added. Security Council Resolution 1441 - which returned the inspectors to Iraq - authorises them to take scientists and their families abroad for an interview and the United States has been pressuring inspectors to exercise this right. Hans Blix has asked the Iraqi authorities for a list of scientists which Mr Amin said would be ready in "two or three days". Relief agencies have begun preparations for war in Iraq, fearing that military action will only aggravate the suffering of ordinary Iraqis. One, the Catholic Agency for Overseas Development (Cafod), estimates that a US-led attack could result in between 10,000 and 100,000 civilian deaths, including deaths from disease and population displacement. And US and British planes patrolling the no-fly zone over southern Iraq have bombed a military command and communication centre, US officials say. The action came after the shooting down of an unmanned US plane by the Iraqis on Monday. "Iraq is opening up to the UN teams"
"Nato matters more now than it has for many years"